We’ve made it to day five! With your cute hearts attached to your skirt, we are now ready to gather and attach our skirt to the bodice. There are many different ways to gather your skirt- my favorite way is to bump up my stitch length to 5 and my tension up to an 8 or 9. Use your favorite method to gather the skirt. Be sure to use a high quality thread and start with long tails on your main thread and bobbin! As you sew, your fabric should gather itself. Adjust your tension as necessary if it appears to be too loose or too tight. After your skirt is gathered, measure it against your bodice and pull your threads and gathers to adjust to fit. I find that ironing your gathers can make attaching them easier, and makes them look neat and tidy. Finish your hem and your dress is complete, well done for making to day 5! Don’t worry if you are still finishing up, you have until Sunday at midnight EST to catch up and submit your final photos. Please post minimum of one progress photo and one final photo in the albums in the LLK Sewing Group, Sew-a-Long photo album.A random winner will be selected and announced on Monday the 11th, so be sure to add those photos to qualify for the drawing. I’m looking forward to seeing all your beautiful creations. Welcome to day four of the Heart-Ford sew-a-long! Today we will be constructing the heart pocket and attaching it to the skirt. You should have cut out two sets of hearts- one main and one lining. 2. Fold the long sides in half wrong sides together and press. 3. Sew a gathering stitch around the raw edge of the folded strip. 4. Gather and pin to fit the right side of the main heart piece. Ironing the gathers can help with keeping them in place. Baste to attach using a 1/4” seam allowance. 5. Place the lining on top of the main heart piece right sides together. If you made the ruffle, it will be sandwiched between the main and lining. Pin in place. Sew around the heart using a 1/2” seam allowance. When reaching the points of the heart, keep the needle down, left the foot and pivot the heart for a nice, sharp turn. Stop one to two inches before finishing the seam, leaving a small opening. Clip the curves and trim down the corners, taking care not to cut through stitching. Turn the heart right side out through the opening. Carefully poke out the curves and corners. Press. Starting a little more than halfway up the heart, with a 1/8” seam allowance topstitch across the top of the heart, ending around the same place on the opposite side. Take the front skirt fold it in half and press to make a center crease. 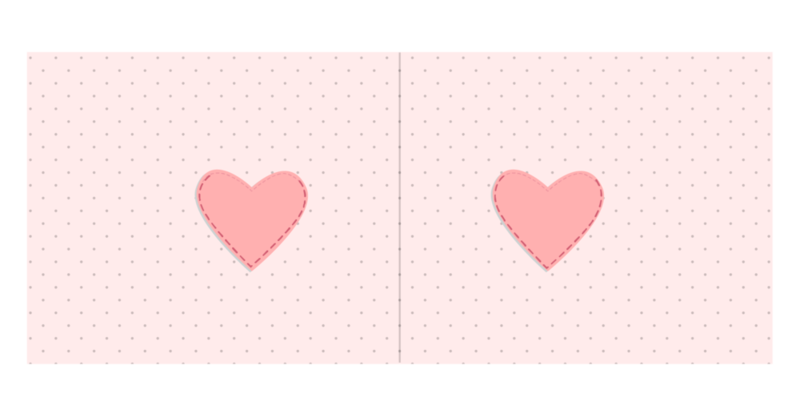 Place the hearts on either side of the center line 2 to 4 inches out from the center fold, and 4 to 7 inches down from the top. (Feel free to put the pockets anywhere you’d like, this is just a recommended placement). Pin in place. Beginning where the topstitching ended, with a 1/8” seam allowance topstitch around the bottom of the heart and stop when the topstitching on the other side is reached. The pockets are now attached to the dress. Don’t forget to post minimum of one progress photo and one final photo in the albums in the LLK Sewing Group, Sew-a-Long photo album. Here we are on day three of the Heart-Ford sew-a-long! Today is all about constructing the bodice of the dress. Depending on what version you are doing, the construction will be different. If you are including a collar, your bodice will have a lining. Neck binding will be used on all other versions. If you are new to sewing knits or want to freshen up on your knit-sewing skills, check out the blog post filled with great tips here. An important part of this step is attaching elastic to your bodice to stabilize your bodice. Make sure to use the wide zig zag stitch, take your time when attaching, and don’t worry if you need to try again if it doesn’t work out the first time. That wide zig zag stitch makes it easy to unpick quickly. With your bodice all ready to go, we are prepared for tomorrow when we will construct the heart pockets and prep the skirt.